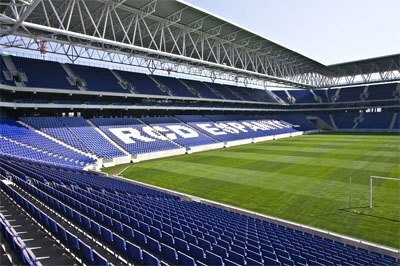 Despite never winning the La Liga trophy, RCD Espanyol is one of the most respected football clubs in Spain. A lot of that admiration stems from the fact that Espanyol is a very history-rich club, having been founded back in 1900. Since the beginning of La Liga in 1929, Espanyol has spent only four seasons outside it. These days, the club is mostly known for its rivalry with the "other" Barcelona club, FC Barcelona. Picture of the team in the 1980s. Espanyol was founded by Angel Rodriguez Ruiz, a student at the nearby University of Barcelona. Rodriguez named the new club Sociedad Espanola de Football, in order to differentiate it from other Barcelona teams that were dominated by foreigners. Today, Espanyol is considered to be the first Spanish club formed exclusively by Spanish fans and students. In 1910, the club changed its name to Club Deportivo Espanyol, adopting the blue-and-white kits they're known for today. By choosing these particular colors, Espanyol paid tribute to Roger de Lluria, one of the most successful naval commanders of all time. Two years later, King Alphonso XIII granted the club his royal patronage; from then on, the official name of the club was Real Club Deportivo Espanyol. Before the establishment of La Liga, Espanyol played in the regional Catalan football championship (Campionat de Catalunya). Second to FC Barcelona, they were the most successful team, winning nine championships. After the creation of a national league, the Catalan football championship co-existed with La Liga until 1940. In 1923, Espanyol moved to the Estadi de Sarria where they would play their home games for the next 74 years. Six years later, they won their first Copa del Rey by edging Real Madrid in a 2-1 thriller. Just a couple of months after that, Espanyol was among the ten clubs chosen to take part in the first official season of the new Spanish national league called La Liga. In 1926, Espanyol was on tour in South America and played in Buenos Aries, Montevideo and Santiago among other places. 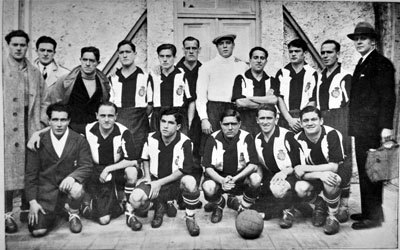 They met clubs such as Combinado Norte, Nacional, Huracán and Santiago-Valparaíso. Many Argentian players has worn the white and blue shirt during the years and the legendary Alfredo Di Stéfano ended his career in the club. Espanyol won another Copa del Rey in 1940 -- shortly after the Spanish Civil War -- but that would turn out to be their last trophy for a while. Despite being a consistent La Liga performer and having players such as Ricardo Zamora, Alfredo di Stéfano, and Laszlo Kubala, the club never managed to oust Real Madrid and Barcelona as the leading clubs in Spain. On the bright side, Espanyol did see some success in European competitions. In 1988, they made it to the UEFA Cup final, where they lost to Bayer Leverkusen despite a convincing 3-0 victory in the first leg. They repeated this achievement in 2007, when a team led by Raul Tamudo (the club's leading goalscorer) defeated Maccabi Haifa, Benfica, and Werder Bremen on the way to the final. In an all-Spanish affair, however, Espanyol lost to Sevilla on penalties. In between these two finals, Espanyol managed to secure two more Copa del Rey titles in 2000 and 2006 by defeating Atlético Madrid and Zaragoza. Interestingly enough, Raul Tamudo made his mark early in both cup finals, scoring in the 3rd minute against Atlético and in the 2nd minute against Zaragoza. Tamudo finished his Espanyol career with 129 goals in 340 appearances. In 2010, the club moved to the RCDE Stadium, a brand-new 40,500-seater. Despite mostly hovering around the mid-table position, Espanyol has been an integral part of La Liga for more than 20 seasons. In recent years, businessman Chen Yansheng took full control of the management of the club, with the acquisition being formally confirmed in 2016. Inside the RCDE Stadium (a.k.a. Estadi Cornellà-El Prat). The current crest was adopted in 1912 and has only undergone minor variation since when. In the first ten years, a red and yellow logo was used (the team played in yellow shirts the first years). The shield consists of a red circle with the text “RCD Espanyol de Barcelona” and inside the blue and white stripes that the team wears on their shirt. On top of the circle, a crown is displayed, typical for Spanish football clubs.